Because we pretty much did everything there was to do on our first couple of days in Brunei, on our last day we rented a car with a driver (it cost us BND70 – about $55 – for 5 hours) and at 1pm, after checking out of the hotel, we went off for our beach hopping trip. And in less than 30 minutes, we were at Muara Park (and since I know a nice playground is a rare find here in Manila, I took a few pictures in case any Foreign Service folks are thinking of bidding for a post in Brunei). The soft white sand was a nice change from the Philippines (where we mostly deal with crushed coral), but the view of the beach reminded me a lot of the US east coast beaches (except with much finer sand, like we have in Rio). The one main difference? The water wasn’t just lukewarm like Caribbean beaches (or super-cold like east coast beaches), it was hot like a hot tub. As in, we would get up to hit the air and refresh ourselves, because even though it was a hot day, the air was cooler than the water. After an hour at Muara Beach, we hopped back in the car on our way to our next destination, Meragang Beach. And we were hit with this… Yep, construction work going on at the beach (looks like a house is going up) and there was dirt on the whole beach front. Needless to say, we didn’t stay. So we continued on to what quickly became our favorite beach in Brunei: Berakas Beach! The water though still warm, it wasn’t nearly as hot as Muara Beach (my only guess for this is that is probably due to rivers near Muara Beach, which are likely making the water warmer? What do I know?). I took strategic pictures showing the water, instead of the trash strewn around (though you can see a little bit of it on the picture above), then we took off. We really didn’t want to get into the water, so back we went to Berakas to shower. On the way back to Berakas, we stopped by at Tungku Beach, in hopes of finding a shower (there was nothing), but we did take a few good pictures! This seems to be the place for ATV riding, there were groups riding them everywhere (lots of dirt roads here). Going back to Berakas to use the showers was worth it though, we encountered monkeys on the way back in to the park! After showering, we headed back to Gadong (the area where we were staying) and killed a few hours eating yummy food at the night market, catching a movie, then grabbed our stuff at the hotel to head off to the airport for our 2am flight. 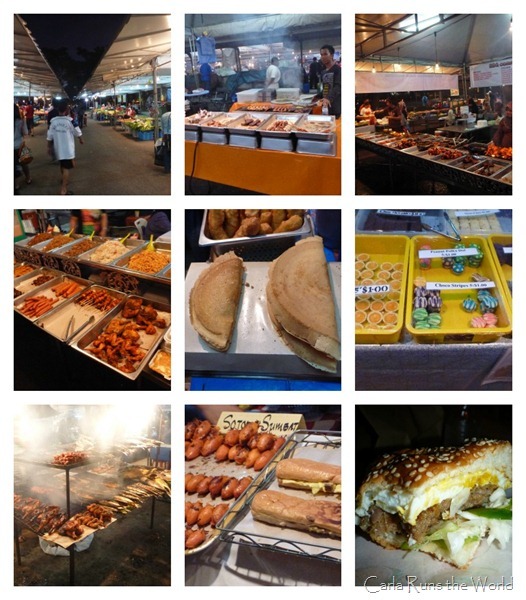 Filed under Asia, Pictures, Travel, Traveling in Asia, Trips! Remember how I posted that a friend said it was very boring? Yeah… About that… It was. I guess the combination of a tiny-tiny country that is also a dry country, means there’s not much to do. We walked the whole downtown area in about an hour, and that included stopping around and taking pictures. I think the lack of a culture where people just hang out, even if no alcohol is involved, doesn’t help with the entertainment. It’s not like there is a place with outdoor seating where we can just chill for a bit. 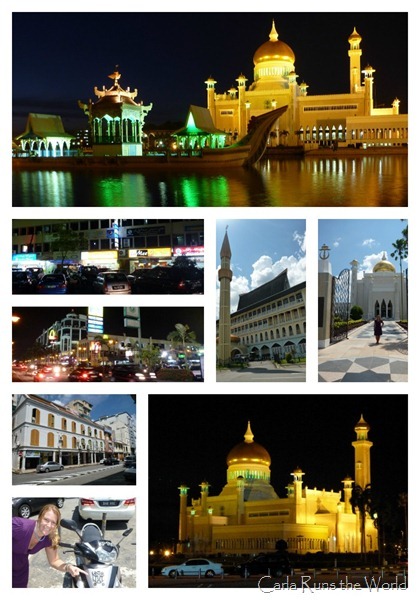 So we hung out for a couple of hours at a internet cafe to kill time, as we figured since we were already there, might as well wait around until nightfall to get pictures of the Sultan Omar Ali Saifuddin Mosque at night. 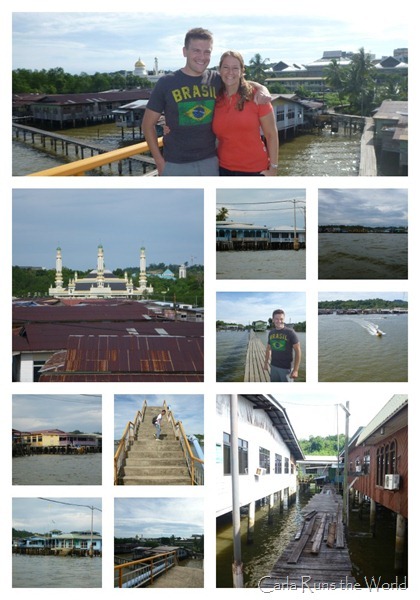 The next day, we went on a tour to see the proboscis monkeys (they deserve a post of their own), then we did a quick tour through part of the water village (over 30,000 people live in the water villages there!). Which brings me to another point… It’s a good thing it’s a dry country – can you imagine being drunk and walking over those narrow walkaways? We also visited the Royal Regalia Museum (no pictures allowed there), and then went to see the inside of the mosque, and yep, I had to cover myself up – they do provide clothes to borrow, which was convenient. 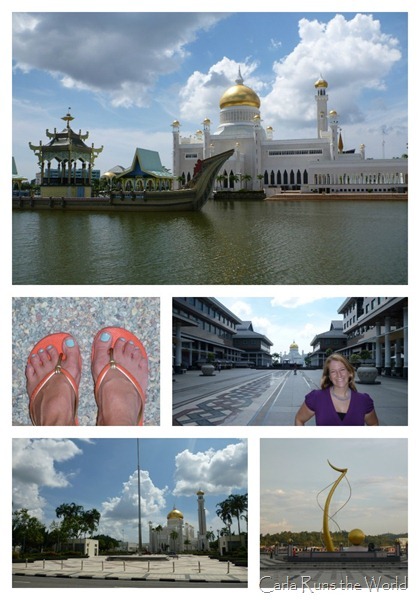 On the last day we hired a car to take us beach-hopping (this also deserves its own post), then stopped at the Bolkiah Mosque on our way back – it was gorgeous! — before hitting the night market for dinner on our last night. We had enough time to catch a movie, then headed to the airport around midnight (and even though it was a 10 minute ride, it set us back $35, ouch). 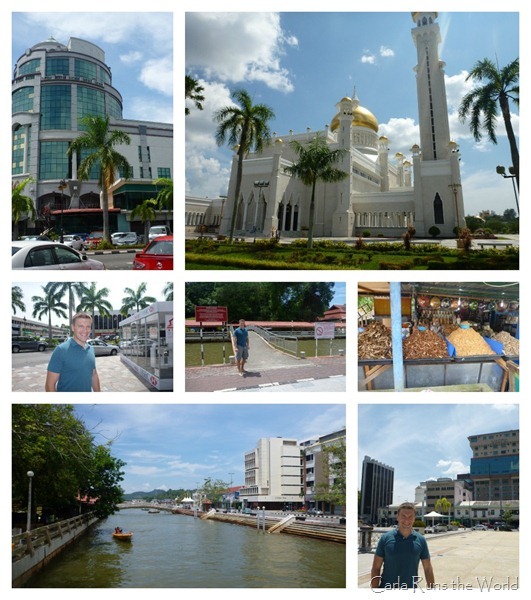 Brunei was definitely very different than all our other trips. It was good to go, and we don’t regret it, but we’re used to walking around everywhere seeing many new things, and there was just not that many things to see. Think of the smallest town you ever been to, and this would be similar in the entertainment value (we usually don’t take 4 hour naps or go to movie theaters on a 3 day trip!). We had a blast seeing the proboscis monkeys and the beaches, so I’ll definitely talk about them separately.